Boggle your mind with the weird and wonderful facts, photos, and illustrations packed into the pages of this awesome almanac. I Can't Believe It! 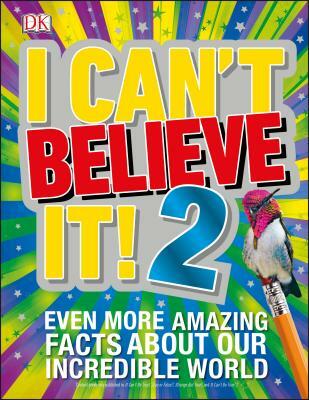 2 brings together some of the most fascinating information and myth-busting true-or-false questions from four of DK's bestselling titles: It Can't Be True! (astonishing visual comparisons that explain extraordinary facts about the world around us); True or False? (unbelievable but true answers to big questions); Strange but True! (bizarre beasts, incredible places, and peculiar phenomena that are really real); and It Can't Be True! 2 (a compendium of hundreds more visual comparisons). Covering a huge range of subjects from outer space to dinos, head lice to hamburgers, and snowflakes to fearsome flowers, this is truly a book with the "Wow!" factor that tells you things about our crazy universe you will hardly believe. I Can't Believe It! 2 has something to astound everyone, over and over again. Parents will want to steal this book from their kids.